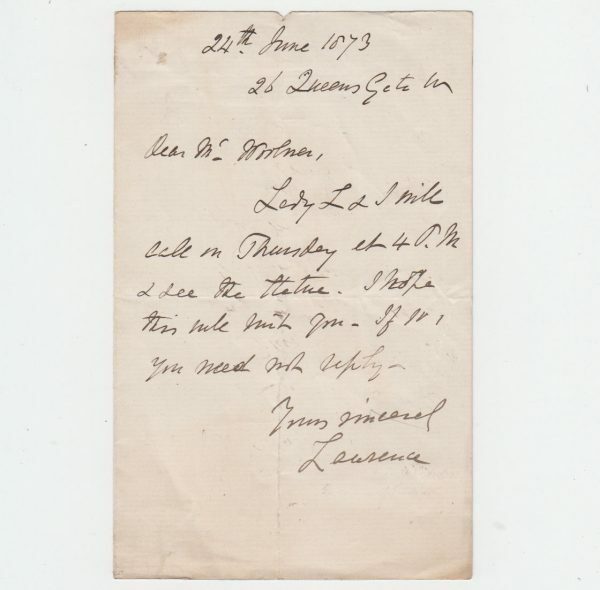 Autograph Letter Signed ‘Lawrence’, to Thomas Woolner, the sculptor, saying that Lawrence and his wife will call on Thursday to see the statue. 1 page 7 x 4 inches, in good condition, one or two blemishes only. 26 Queens Gate, 24 June 1873. John Lawrence (1811-79), 1st Baron, administrator, Viceroy of India (1863-69). Thomas Woolner (1825-1892)sculpted several marble or bronze busts of Lord Lawrence.